It's constant for these apps. Always reproducible. There were more but I don't currently remember them, probably because I don't use them on a regular basis. This has been a case since I bought my Radeon 7870 in May 2013 - so it's not a problem with a specific version of package. The slowdown affects everything. I just OpenTTD in 1280 and every application is chopping. The text I currently write appears with delays comparable to an SSH connection across the ocean. That's a whole lot of pixels but on 2x NVidia cards with Nouveau and Xinerama (!) I was able to play OpenTTD in 3840x1200. It couldn't handle more because of CPU usage. So if Xinerama was able to handle it, a "native" driver has to handle way more. The more resolution I set in OpenTTD, the more /usr/bin/X process takes CPU. Java (at least AWT) applications are extremely slow. It is painfull to use some IP-KVMs. Agreed. Soap UI is terribly slow. Fortunately, Java IDE I use (IntelliJ IDEA) allows me to set a GTK look and feel. It's fast. This is probably related to bug 68524, or may be even a duplicate. > This is probably related to bug 68524, or may be even a duplicate. to pure software rendering patch which leads to texture download (glReadPixels) and texture upload, the downloading/uploading is really extreme slow. Need someone to identify the fallback code path and optimize it to avoid the fallback. This slowdown is due to the way glamor_copy_area works when the source pixmap is on the CPU and the destination pixmap is on the GPU. EXA specifically handles this path by copying straight from the data into the destination, so I have attached a patch that does a similar thing. I also had to update how __glamor_upload_pixmap_to_texture works to properly account for texture data that is aligned differently, so there may still be some bugs with it. The patch will make openttd faster, and should also make other things faster as well, like text rendering, due to the way it works, but I haven't run any benchmarks or anything. Thank you Anthony, I will check it out tomorrow. I see some flashing black blocks semi-frequently when running openttd so the patch isn't quite bug free, I'll see if I can figure it out. OK. Please keep me informed. I didn't have time to try the patch today though, but I'll take a look asap. Thanks. Soap UI is a bit faster. I'd say +50% fps. The same applies to recording a screencast with kdenlive, I believe there were some more fps this time. But there's still much to improve there. There must be some other places in the code that still slow glamor down I believe. But this patch is a great step towards the performance anyway! Thanks for your great work. // Tested on Arch Linux with glamor from git and this patch. Package in AUR: https://aur.archlinux.org/packages/glamor-egl-git/ + Anthony's patch. That sounds good, the flashing blocks maybe due to something else then, I'll look into it more to see if I can figure it out before posting the patches to the mailing list. As for those other slowdowns, I'm not too sure of their cause, but I will look into them once I close out the other patch. Did you consider using something like GLX_EXT_texture_from_pixmap to get a GL texture ID from a pixmap without copying anything? @Anthony: Ignore what I said before. The patch looks good at first glance, but I don't understand why you changed the stride parameter of glamor_upload_sub_pixmap_to_texture to 0 at several places. > glamor_upload_sub_pixmap_to_texture to 0 at several places. I think I changed it because glamor_upload_sub_pixmap_to_texture originally didn't actually use the parameter so I set them to zero because I saw some corruption. I changed them back to their original values and things seem to be okay. Setting the stride to 0 for those causes fixed the issue, to be honest I'm not 100% sure what it is supposed to be. I'm still getting the flashes of black occasionally when playing OpenTTD, I'm not too sure of the cause at the moment because EXA doesn't have the issue and I cannot seem to reproduce it any where else. I run Arch Linux, so I am up to date with kernel, X, drm and such. Maybe it's not working for you because of some older stuff? I am up to date, mesa, kernel, X, and drm are latest from git, I also tried mesa 9.2.5 and had the same issue. I notice it mostly on the introduction screen, every couple of seconds a small rectangle will fill with black/white, it doesn't appear to happen consistently making it hard to pinpoint what the issue could be. "Speed up glamor_copy_area for certain use cases" (https://bugs.freedesktop.org/attachment.cgi?id=91380) seems to fix my KDE raster backend issue (bug #69341 https://bugs.freedesktop.org/show_bug.cgi?id=69341) hurray!!! I've just tested this patch together with "First attempt at handling diagonal lines in poly_line code" from #68524: libreoffice calc works without glitches and windowmaker draws its menu in a flash (hurray! ), gtkperf show better results too (not only with GtkDrawingArea - Lines). Hleb, would you please try out openttd and confirm or deny the glitches Anthony is experiencing? Thanks. > Anthony is experiencing? Thanks. No, I don't have nothing like "every couple of seconds a small rectangle will fill with black/white" the image is clean, scrolling speed is good (1280x1024), but X11 CPU usage is rather high (~30% of 1.8 GHz). I have another computer with a radeon 6570 with more stable software so I will try that to see if the cause is with my particular setup or not. I can confirm that this patch fixes performance problem in openttd and I don't see any glitches. There are some lags (especially in mouse cursor movements) on the introduction screen, but the game performance is great now. Here is an example of the black rectangles that I am seeing. They pop on the screen and then disappear very quickly. I tried testing this on another machine with a Radeon 6570 with more stable software (kernel 3.12, mesa 9.2.5) and I still experienced the issue. For those that do not have the issue can you report your video card along with the version of mesa/kernel/libdrm? I tried the llvmpipe driver and it also had the issue so I'll have to figure this out more. > the version of mesa/kernel/libdrm? Note, that I disabled ColorTiling2D due to the massive screen corruption (bug 71488). This patch introduces some warnings, see below. Please clean it up and submit it to the glamor mailing list. @Anthony, @Michel, in the mean-time other guys fixed the problems with rendering lines. Now gtkperf works smoothly and doesn't make the OS unresponsive. 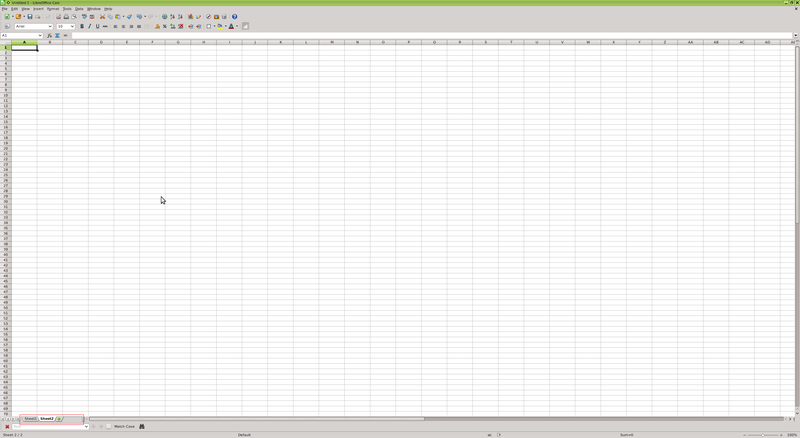 LibreOffice Calc works as expected. SoapUI is faster but still just a bit choppy. No change in speed for applications that record what's happening on the screen though (Skype, TeamViewer, Kdenlive). If we get this patch merged into upstream, I think I should close this one. A new bug report will be just about screen-recording software. I'll see if I can split the this into two patches, one that adds the stride parameter to upload pixmap to texture and the other as the one that accelerates the corner case. I submitted it as two separate patches.